Sharon Page sparkles in this poignant and irresistibly entertaining follow-up to her breakout novel, An American Duchess. Lady Julia Hazelton is the most dazzling among 1920s England’s bright young things. But rather than choosing the thrill of wanton adventure like so many of her contemporaries, Julia shocks society with her bold business aspirations. Determined to usher the cursed Worthington estate into a prosperous, modern new era, and thus preserve her beloved late fiancé’s legacy, the willful Julia tackles her wildest, most unexpected adventure in Cal Carstairs, the reluctant new Earl of Worthington. he unconventional American artist threatens everything Julia seeks to protect while stirring desires she thought had died in the war. For reasons of his own, Cal has designed the ultimate revenge. Rather than see the estate prosper, he intends to destroy it. But their impulsive marriage—one that secures Julia’s plans as well as Cal’s secrets—proves that passion is ambition’s greatest rival. Unless Cal ends his quest to satisfy his darkest vendetta, he stands to ruin his Worthington wife and all her glittering dreams. Check out all of the stops on this book tour! Set in England during the 1920s, The Worthington Wife is a story of loss, love, and murder! Lady Julia Hazelton has know and lost love twice in her life and has given up on ever finding it again. She puts her heart and soul into keeping her ex-fiance's family estate afloat and moving it into the modern age. The arrival of brash American Cal Carstairs, a man determined to see the estate fail, keeps Julia on her toes and her heart guarded. 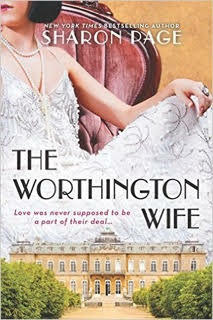 The Worthington Wife reads like a traditional Harlequin in that the romance is quite over the top (not a bad thing!)! Right off the bat, I could tell that the new earl was going to be trouble and he did not disappoint. He's quite the interesting gentleman—a gang member as a boy, a pilot in the war, a tempestuous painter, and suddenly a unconventional aristocrat with an estate to manage. He's definitely an alpha hero struggling with his past and his newfound wealth. Julia on the other hand is a great character. She really is a great example of the battle between old world tradition and new found freedom. She's a fine lady who loves her family estate and its history, but someone who also wants to be seen as an independent woman. This book is a fun escape. It's definitely more detailed than a lot of books I've read from HQN, and I really appreciate that Julia is such an authentically written character. She doesn't seem like a modern character thrown into a historical setting, which so often happens with a lot of these historical romances.While it is a sequel, it can be read on its own. I will say that I am a little disappointed that Daniel Carstairs didn't get his own story. Even though he is introduced later in the story, he quickly became a favorite of mine! I hope these characters make appearances in future stories from Sharon Page!